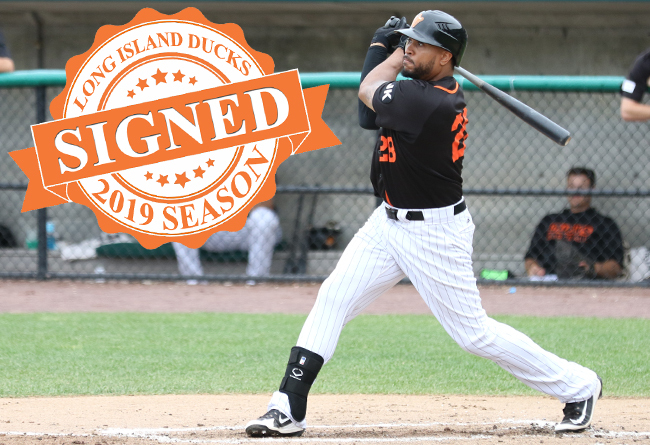 (Central Islip, N.Y., March 5, 2019) – The Long Island Ducks today announced the signing of outfielder Daniel Fields. The former Major Leaguer enters his second season with Long Island and 10th in professional baseball. Fields played in 96 regular season games during his first season with the Ducks a year ago. He finished the season with a .267 batting average, nine home runs, 40 RBIs, 48 runs scored, 21 doubles, and three triples. The Detroit native also showcased tremendous speed, stealing 12 bases in 13 attempts, good for a .923 stolen base percentage that ranked second in the Atlantic League. Defensively, Fields posted a .986 fielding percentage over 90 games played in the outfield, committing just three errors while totaling nine assists. The 28-year-old shined brightest over the final two months of the regular season. He compiled a .315 batting average with five homers, 19 RBIs, 27 runs, 45 hits and 12 doubles over 38 games during August and September. Fields then played in all 10 of Long Island’s playoff games, collecting a homer, seven RBIs, six runs, 10 hits and four walks. Prior to joining Long Island, the outfielder spent the first six seasons of his professional career in the Detroit Tigers organization. He reached the Major Leagues with his hometown team in 2015, collecting a double and a run scored in his MLB debut against the Oakland Athletics. The son of former big league outfielder Bruce Fields, Fields was named an MiLB.com Organization All-Star in 2013 with the Tigers. He later split time with the Chicago White Sox and Los Angeles Dodgers organizations in 2016, reaching the Triple-A level with both. Fields was originally selected by the Tigers in the sixth round of the 2009 amateur draft.